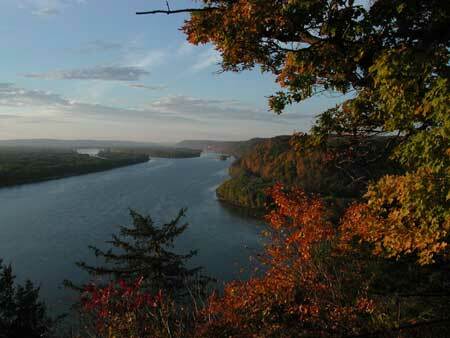 Effigy Mounds National Monument is located in Allamakee and Clayton counties in the northeastern corner of Iowa, along the west bank of the Mississippi River. Steep bluffs, floodplain terraces, and swift cutting streams channeling deep into the bedrock terrain characterize the 2,526-acre monument. In the 1890s, Iowa State Geologist Samuel Calvin described the landscape as "gashed and furrowed in every direction by an intricate system of ramifying channels." The area features a unique topography, where western prairies merge with eastern woodlands. This ecological transition zone provides one of the most biologically and topographically diverse regions in the statea crucial factor in the success of prehistoric settlement and the development of a distinctive Effigy Mounds culture. Many of the more than 200 mounds within the monument are located on low-lying floodplains, at an elevation of 600 feet above sea level. Some mounds are situated atop the steep bluffs and open fields of the upland areas that reach, in their highest places, 1,000 feet or more above sea level. Since the first European settlers arrived in Iowa about 160 years ago, Iowa's native habitats have been greatly reduced by domestic farming, transportation- related construction projects (including railroad logging), damming of rivers for barge navigation, and draining of wetlands (especially after the Federal Swamp Land Act of 1850). James Dinsmore estimates that about 0.12 percent of Iowa's original tallgrass prairie, 4 percent of its forests, and less than 10 percent of its wetlands survived in the mid-1990s. This rapid alteration of the region's environment has had drastic effects on the state's wildlife, greatly reducing the numbers of many species and extirpating others. In much the same way, the extant landscape displays the interconnected influences of cultural and natural components in a continuously evolving relationship. Human societies are linked to the physical environment through the use and adaptation of available natural resources, as environmental constraints help define settlement and subsistence options available to a particular social group. These constraints include proximity to water, climatic patterns, access to lithic resources, and the presence of game and edible plants. Parameters such as these affect site selection for settlements and influence the likelihood of the site's subsequent preservation. Only sites preserved through a combination of environmental and geographic factors remain sufficiently intact to yield information concerning prehistoric peoples. Consequently, the information available about patterns of human occupation in a given area is shaped both by the type of societies that occupied the area and the subsequent and contemporary environmental conditions present at the site. 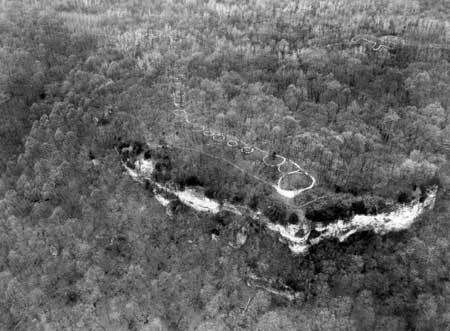 Aerial view of the Fire Point Mounds.